There’s a saying in dog breeding: "like produces like." A good breeder knows this and will attempt to pair dogs similar in conformation, drive, disposition and trainability together so the puppies will be of consistent and known quality. When it comes to selecting a puppy that is to be used for a very specific task, such as hunting, the show ring, herding or guide and detection dogs, future successes and ease of training for those tasks are heavily dependent genetics. Finding the best line of dogs with proven genetics, as well as the disposition and conformation you want is most greatly influenced by the dog’s sire and dam. Too often today it seems that an inordinate amount of emphasis is placed on the sire’s accomplishments and lineage. While selecting a sire with a pedigree decorated with titles, or one with comprehensive experience, from the venue you’re wanting to participate in is important, the dam’s genetics, disposition and pedigree are just as important, if not more so. There’s a theory out there, one that I like to keep in mind when looking at pedigrees, which says the bottom line of a dam’s pedigree is as important as anything in your dog’s ancestry. And it makes sense. Both parents supply fifty percent of a puppy’s genetics, so of course a prospective dam should have breeding, training and testing credentials on par, or at least somewhat similar, to the sire’s accomplishments. The bottom-line theory takes it step further and points out that by looking at the base line of a pedigree, you can get a quick, accurate and nearly all-encompassing historical look at a pup’s genetic abilities. I’m not sure I’d take it quite that far, but looking at that bottom line and not seeing dams with titles and/or other accomplishments for generation after generation should send a red flag up. Even if nondescript dams are paired with accomplished sires, their progeny only possess half of those tried and tested genes, and each successive generation without a balanced pairing only dilutes those genes further. 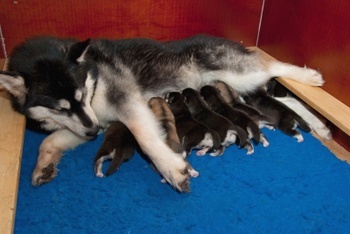 Additionally, a puppy inherits fifty percent of its genetic health from each parent. Having each parent undergo genetic screening prior to breeding will ensure that the puppies are as healthy as possible and free of genetic mutations that could limit their activity or shorten their lifespan. You can’t dismiss the importance of either side of your dog’s pedigree in favor of the other, but when looking at a pedigree, your goal should be to find the most balanced ancestry possible to ensure that the strong traits, desire and trainability required for the task you wish to accomplish are present and that each parent is clear of genetic disorders. Does your Dachshund sleep too much? Additionally, the dam also provides the first environment, the womb, which can have effects not only on the litter, but on subsequent generations, through a process known as epigenetics.